If there is a time machine, would you like to take a break from the stressful life for a while and go back to your carefree childhood? 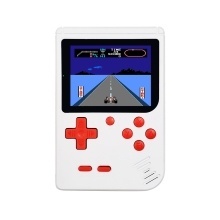 This nostalgic handheld game console is built-in with 400 classic video games from 90s, enough to amuse and relax you after a tiring day! You can&apos;t miss it!